a method for control of pain based on use of a pump for the constant intravenous or, less frequently, epidural infusion of a dilute narcotic solution that includes a mechanism for the self-administration at predetermined intervals of a predetermined amount of the narcotic solution if the infusion fails to relieve pain. a drug-delivery system that dispenses a preset intravascular dose of a narcotic analgesic when the patient pushes a switch on an electric cord. 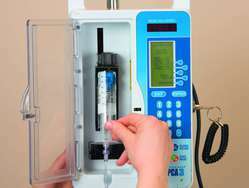 The device consists of a computerized pump with a chamber containing the drug. The patient administers a dose of narcotic intravenously when the need for pain relief arises. A lockout interval automatically inactivates the system if a patient tries to increase the amount of narcotic within a preset period. Pain management A method for self-administration of narcotic-analgesics via a programmable pump; PCA is used for pain of terminal CA, postsurgery, angina pectoris, L&D Agents Fentanil, meperidine, morphine, sufentanil; PCA is delivered IV, subcutaneously or epidurally. See Pain. A method for control of pain based on use of a pump for the constant intravenous or, less frequently, epidural infusion of a diluted narcotic solution that includes a mechanism for the self-administration at predetermined intervals of the narcotic solution should the infusion fail to relieve pain. A method of pain control in which the patient cooperates. An intravenous drip is set up and the patient has a small control unit with a button which, when pressed, inserts a small dose of a drug such as morphine, into the infusion fluid. Overdosage cannot occur. A disadvantage is the need to urinate at frequent intervals. Method for control of pain using a pump for constant intravenous or epidural infusion of a dilute narcotic solution that includes a mechanism for self-administration at predetermined intervals. The company said that ARX-01, which is the Sufentanil NanoTab PCA System, is its novel sublingual patient- controlled analgesia system.